In a city chock-full of ethnic restaurants on practically every block, Russia Samovar, the elegant, 100-seat eatery in the heart of the theater district, has been distinguishing itself as one of New York’s premier nightspots for over three decades. Founded in 1986 and previously co-owned by ballet legend, Mikhail Baryshnikov, and Nobel Prize winner for poetry, Joseph Brodsky, its 19th-century feel, complete with Russian folk prints and green and red shades, has become an epicurean epicenter for discerning patrons from every walk of life, along with many famous Russian poets and writers who keep coming back for an exceptional dining experience second to none. Its house specialties include Shaslik Karski (rack of lamb marinated in Georgian spices), Pozharski (ground veal and breast of chicken cutlets), Chicken Kiev, Pelmeni (veal and chicken dumplings), and Chicken Tabaka, a baby chicken split and grilled. Side dishes like marinated red cabbage, boiled or mashed potatoes, and vegetables complement each entrée, while for dessert there’s the Zapekanka (Russian cheesecake), the Soviet inspired Crème Brûlée, or the Medovik (layered honey cake), among other delicacies. 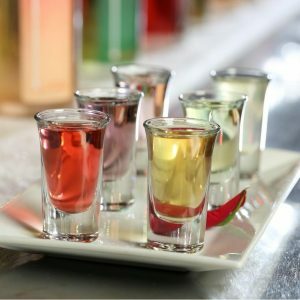 Russian Samovar is also well-known for its 26 flavored vodkas, including ginger, horseradish, lemon, and cranberry along with mouthwatering appetizers. Selections range from Beluga and Ostera caviar, Blini (crepes) filled with salmon or caviar, the Assorted Fish Platter (in-house cured Salmon Gravlax with dill, Smoked Atlantic Salmon and Smoked Butterfish), Vol-au-Vent (a wild mushroom puff pastry), traditional Borscht, and Pelmeni Stroganoff (veal and chicken dumplings with sirloin tips in a creamy mushroom sauce). The restaurant also serves a theater pre-fixe menu, available Monday through Friday until 7pm. The ideal spot before or after a show, you can get a 10% discount on all food items simply by presenting your ticket from any Broadway show. These include appetizers like Olivier Salad, Eggplant Caviar, and Vinegret (beet and vegetable salad), entrées such as Roasted Duck, Grilled Salmon, and Beef Stroganoff, and a choice of Smetannik Cake or Ice Cream for dessert. You can also enjoy an expertly prepared pre-dinner cocktail at the bar such as the Russian Beauty, featuring raspberry puree and crisp Prosecco or a martini made with any flavor of Russian Samovar’s house-infused vodkas. 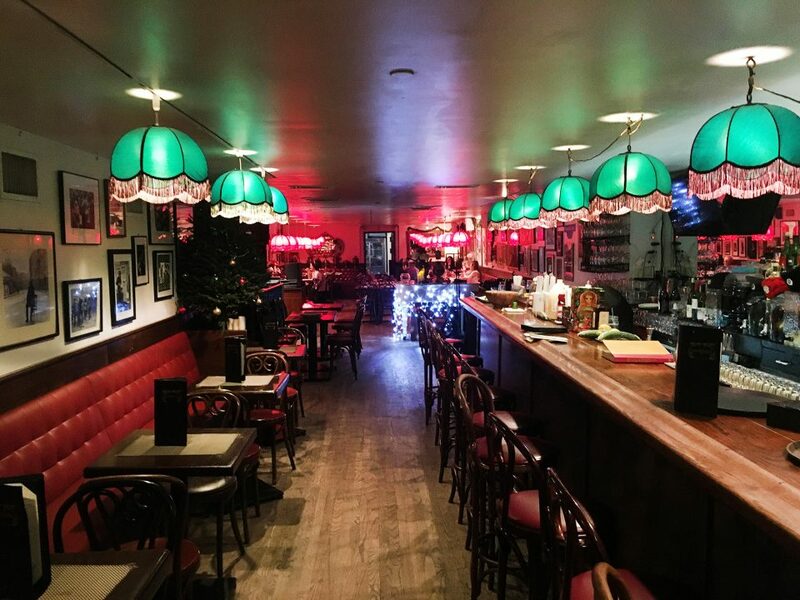 Currently owned by Roman Kaplan and managed by his daughter Vlada Von Shats and her two sons, another major draw of Russian Samovar’s 256 West 52nd Street location is its deeply entrenched show business roots. Besides currently being a mecca for Russian writers and poets located just steps away from the Great White Way, it was also the former site of Jilly’s—the eponymous celebrity watering hole once owned by Frank Sinatra’s friend and former bodyguard, Jilly Rizzo, which was regularly frequented by Sinatra himself. In fact, the Chairman of the Board held many personal concerts there, along with spending time with the Rat Pack and playing countless games of baccarat. These days, this tradition continues thanks to singers like Liza Minnelli and Cyndi Lauper who still occasionally drop in for an impromptu performance. 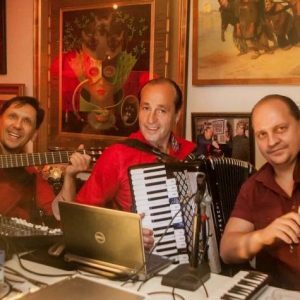 And since Russian Samovar also regularly attracts many musicians, actors and writers from Russia and all over the world, a classically trained pianist performs nightly and there are poetry readings held throughout the year. There’s also live interactive theater, performances by opera singer Michael Peer, the Gypsy Fun Trio playing traditional music on the violin and guitar on Fridays and Saturdays, and a Jazz Blues Brunch on Sundays featuring the Uptown Jazz Company. A major supporter of all aspects of the visual and performing arts, the restaurant seats 100 in the dining room and 50 at the bar, as well as private spaces on its second floor, making it the perfect location for private events of all kinds.